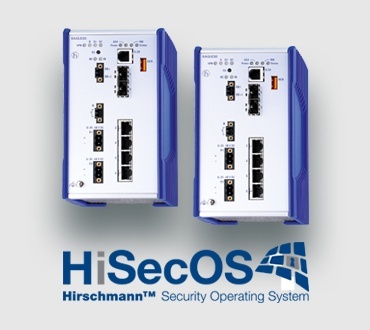 The new Hirschmann Security Operating System (HiSecOS) gives customers a greater level of insight into network data, as well as the ability to more easily create network routes and connect to multiple secure sites. Similar to previous versions, HiSecOS is exclusively developed with Hirschmann’s multi-port firewalls, the EAGLE20-0400 and EAGLE30-0402, in mind to heighten overall network performance and offer more robust security features. Due to ruggedized design, EAGLE firewall products with HiSecOS operate in various harsh industrial environments, including automotive, power transmission and distribution, oil and gas, and mining. - Built-to-order with various configuration options for up to eight ports, including Fast Ethernet, gigabit and symmetrical high-speed digital subscriber line (SHDSL). - Eliminates the need for multiple routers, which saves significant time and costs. - Added support for SHDSL connections. - Customers can now transmit network control and monitoring data over traditional copper telephone lines. - Version 1.2 of the Hirschmann Security Operating System (HiSecOS) heightens network performance and adds more robust security features for the EAGLE firewalls. - New features include virtual router redundancy protocol; Ingress Protection and access control list filters; and small form-factor pluggable support for gigabit twisted pair cables.